One of my favorite genres of reading is financial history and nobody does a better job than Roger Lowenstein. 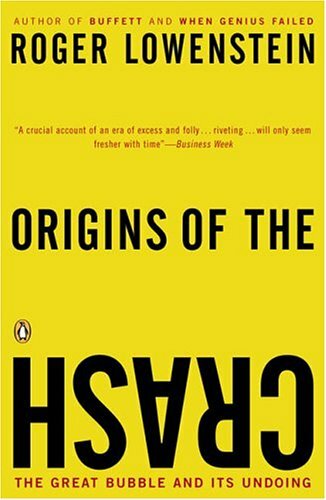 Origins of the Crash: The Great Bubble and Its Undoing by Roger Lowenstein takes you through the economic history leading up and covering the stock market crash of 2000-2002. This book is outstanding and I enjoyed it even more than his book When Genius Failed. It always a good exercise to step back from the day to day chaos of the markets and see the bigger picture. Knowing history is the first step to making sense of the present. I highly recommend this book and look forward to reading Roger’s new book when it gets released in May. That book is titled While America Aged: How Pension Debts Ruined General Motors, Stopped the NYC Subways, Bankrupted San Diego, and Loom as the Next Financial Crisis.